Thomas Schwenke, Inc. 50 Main St. North Woodbury, CT 06878 fedfurn@schwenke.com www.schwenke.com Hepplewhite Dining Chairs Exceptionally fine and rare set of 12 Hepplewhite transitional mahogany dining chairs, with arched crest rail and flaring stiles, with pierced cutout splat in prince of wales design, with molded front legs and "H" stretchers, with slip seats. Connecticut, circa 1790-95. Attributed to Richard Fosdick, New London. See Plate 99, 100, 101, pp. 83-4 New London County Furniture 1640-1840, Lyman Allyn Museum. 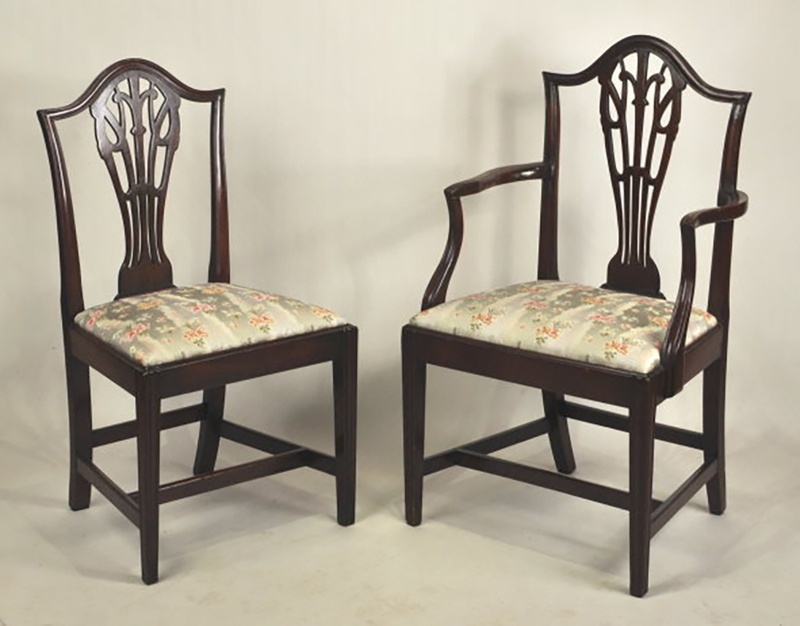 (Two later side chairs). 38" high, 21" wide, 19" deep.